It’s been a long time waiting but Paramount Pictures has finally released a compilation of all 7 seasons of Star Trek: The Next Generation. The Blu-ray boxed set is comprised of 41 discs covering all episodes of TNG from 1987 through 1994 that have been digitally restored and meticulously remastered for high definition Blu-ray. As with the single seasons, the TNG episodes on Blu-ray are formatted in MPEG-4 video at 1080p resolution with a DTS-HD Master Audio 7.1 soundtrack. And while there are no new supplements in this set, Paramount has designed some really nice packaging for this edition. For those who want to spend a little less and get the complete series on DVD to play on PCs, car entertainment systems, or portable players, Paramount also has released Star Trek: The Next Generation: The Complete Series in a 48-disc set that retails for $129.99. Individual seasons of TNG first started hitting stores in 2012, but now Trek fans can get the complete series in one box that’s a lot cheaper than buying single seasons. 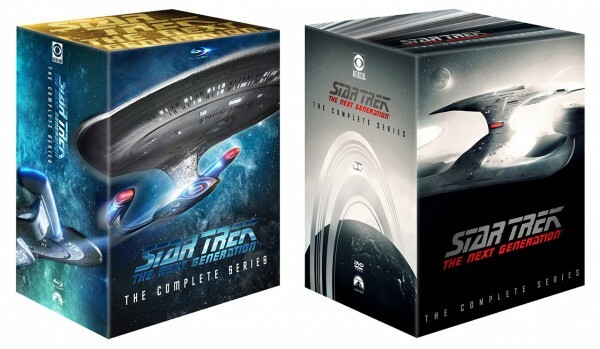 The complete series of “Star Trek: The Next Generation” has been out on blu-ray since 2014.